Prickly Ash scientifically known as Zanthoxylum americanum is a shrub or small deciduous aromatic tree, of the Rutaceae (citrus) family. The plant is native to central and eastern portions of the United States and Canada. 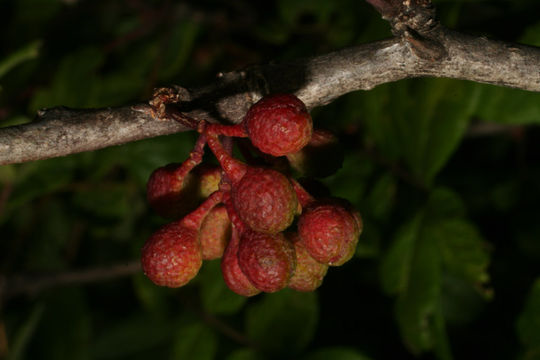 It is the northernmost New World species in the Citrus family, and is part of the same genus as Sichuan pepper. 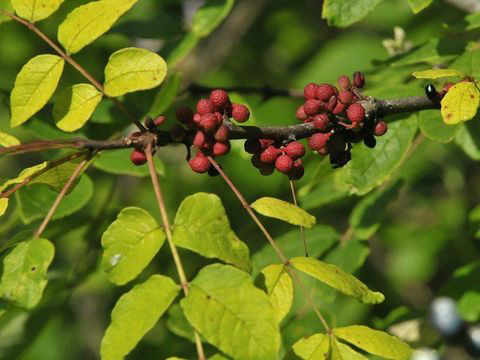 Other common names of prickly ash are Common Pricklyash, Northern Prickly-ash, Toothache Tree, Yellow Wood, Suterberry, chuan jiao, Toothache Bark, Pepper Wood and Suterberry. Genus name comes from the Greek words xanthos meaning yellow and xylon meaning wood for the color of the heartwood of some species. All parts of this plant (leaves, flowers, fruit, bark and roots) are aromatic (lemony fragrance). Sometimes commonly called toothache tree because Native Americans chewed the bark or fruits (producing a numbing effect) for relief from toothache pain. Native Americans also prepared a variety of medicinal decoctions from the bark and roots for treatment of such problems and fever, coughs, gonorrhea, rheumatism and external wounds. Prickly Ash is a small aromatic, perennial tree or shrub that grows about 10 meters (33 ft.) tall with a diameter of 15 cm (6 in). Plant is found growing along upland woodlands, bottomland woodlands, savannas, wooded ravines, thinly wooded bluffs, edges of shady seeps, stream banks in wooded areas, thickets, pastures, and fence rows. It prefers different types of soil including those that contain loam, clay-loam, and rocky material. Bark is gray to brown and fairly smooth, although on old large shrubs it can become shallowly furrowed with a wrinkled appearance. 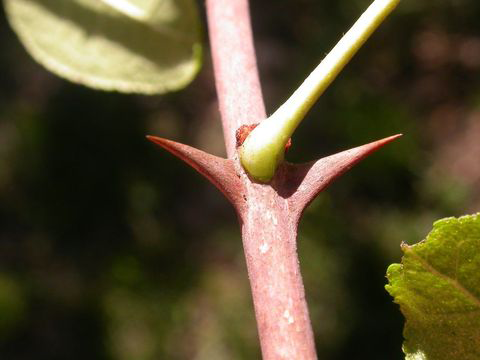 The branches are dark brown and armed with 8 to 13 mm-long prickles along the branches, twigs and shoots; these spines are somewhat flattened and curved. When broken, the twigs have a strong odor reminiscent of crushed lemon peel. Twigs are light green initially, turning to reddish-brown in the autumn, then to brown. 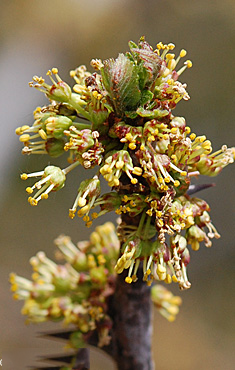 Buds are red and woolly and appear above the old leaf scars. 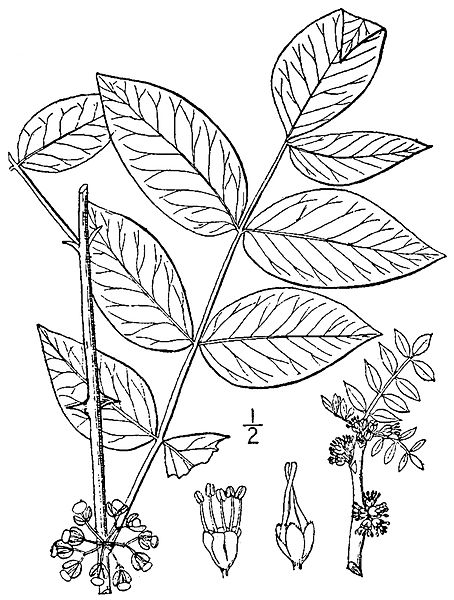 Leaves are alternate compound about 1 to 30 cm long develop along the twigs and young shoots; they are odd-pinnate with 5-11 leaflets. Individual leaflets are 1½-3¼ inch long and ½-1½ inch across; they are lanceolate-oblong to ovate-oblong with margins that are smooth to crenulate (fine rounded teeth). The upper surface of mature leaflets is medium green, minutely glandular, and glabrous, while the lower surface is pale green and short-pubescent to nearly glabrous; in the latter case, fine hairs are restricted to the major veins. Newly emerged leaflets are more hairy than mature leaflets. The lateral leaflets are sessile or nearly so, while the terminal leaflets have slender petiolules (basal stalklets) that are less than ½” long. The light green petioles (basal stalks) and rachises of the compound leaves are hairy while young, but become more glabrous with age; they have scattered small prickles along their undersides. The dark green and lustrous leaves are dotted with translucent glands. 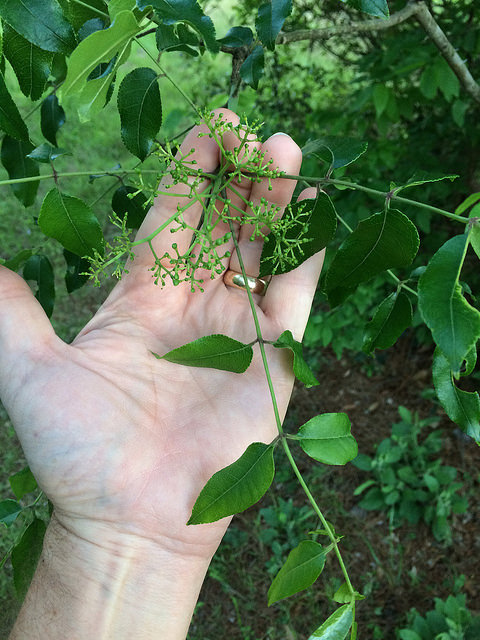 Flowers are arranged in small axillary clusters (cymes) along the branches of the preceding year. Individual male flowers are a little less than ¼ inch across, consisting of 4-5 erect petals and 4-5 stamens; there is no calyx. The petals of male flowers are yellowish green to orange and oblong in shape. Individual female flowers are about ¼” across, consisting of 4-5 erect petals and 2-5 separate pistils; there is no calyx. The petals of female flowers are also yellowish green to orange and oblong in shape. The ovaries of the pistils are glossy green and ovoid in shape; their elongated styles tend to converge at their tips. Flowering normally takes place from May to June. 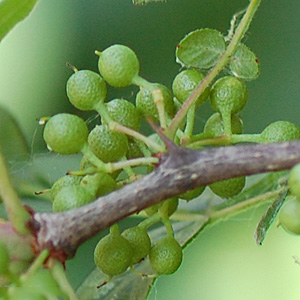 Female flowers give way to clusters of berry-like follicles about 0.5 to 0.6 cm that are ovoid-globoid in shape with a pitted surface (follicles) which mature in late summer. As the follicles mature, they change from green to red to brown, eventually splitting open to expose shiny black seeds with oily surfaces. Each follicle contains 1-2 seeds. Both the crushed foliage and fruits are highly aromatic, somewhat resembling the fragrance of lemon peels. Fruits may be the best ornamental feature. All parts of this plant (leaves, flowers, fruit, bark and roots) are aromatic. Native Americans prepared a variety of medicinal decoctions from the bark and roots for treatment of fever, coughs, gonorrhea, rheumatism and external wounds. 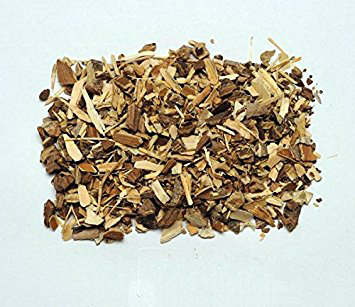 The wood is not commercially valuable, but oil extracts from the bark have been used in traditional and alternative medicine, and have been studied for antifungal and cytotoxic properties. One of the foundational healing uses of prickly ash bark is to improve circulation. 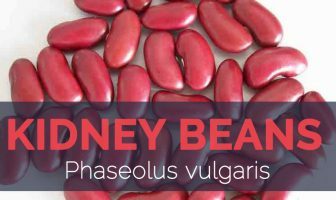 Through increasing the flow of oxygen and nutrient-rich blood through the body, while at the same time cleansing, it is a beneficial herb for the heart and circulatory system. With the presence of a stronger flow of blood, it can improve healing, where nutrients and oxygen are needed. By removing toxins and warming, it can aid rheumatism and aching joints. It can also be used to treat varicose veins. The overall impacts of this herb, stimulating tissue, promoting natural detoxification, and warming and energizing fluids and entire bodily systems, is to encourage the body to return to balance and well-being. Digestive issues, from gas to stomach pains, are relieved. Skin conditions, from acne to eczema, can improve with the elimination of toxins. Use of prickly ash bark is also good for the liver. 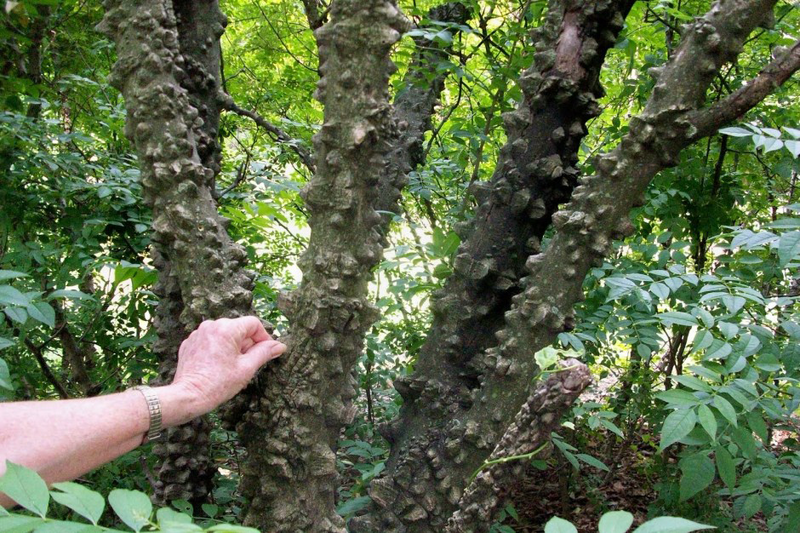 Prickly Ash Bark is considered a diaphoretic that increases perspiration and reduces intermittent fever. This action also helps to rid the body of toxins through the skin in the sweating process. An infusion of the bark was used as a wash to treat itching skin and to treat swollen joints. Infusions of the bark were taken internally for back pain, cramps, pulmonary problems, to treat fevers, and as a cold and cough remedy. Infusions, made from the crushed roots, were used to treat fevers. Poultice made from the inner bark was used to treated rheumatism and sharp pains. Placing the inner bark in the throat treated sore throats. Bark was boiled into a decoction that was taken to induce miscarriages. Plant was used to treat pain after childbirth. Bark infusions were taken to treat worms in adults. Bark of the roots was used to treat colic, rheumatism, and gonorrhea. An ointment, made my mixing the plant with bear grease, was applied to ulcers and sores. Infusions of the berries were used to spray on the chest and throat to treat bronchial diseases, to wash sores, and to flavor medicines. 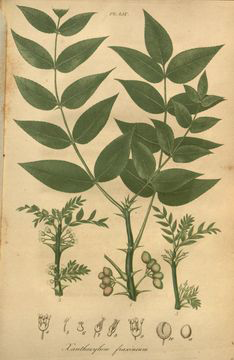 Bark and the berries were used to treat hemorrhages, to make cough syrup, as an expectorant, and to treat tuberculosis. Children who were weak were washed with a decoction of the bark to make their legs and feet strong. Bark was used in different forms to alleviate toothaches. Smoking the bark treated toothache. Bark, either beaten or powdered was packed in and around an aching tooth. Pieces of the bark were chewed to help breakup a tooth that was to be remove. Plant was an ingredient in compounds that were used for kidney trouble, to strengthen convalescing patients, and to induce vomiting. Indians used it to alleviate rheumatism and toothache. 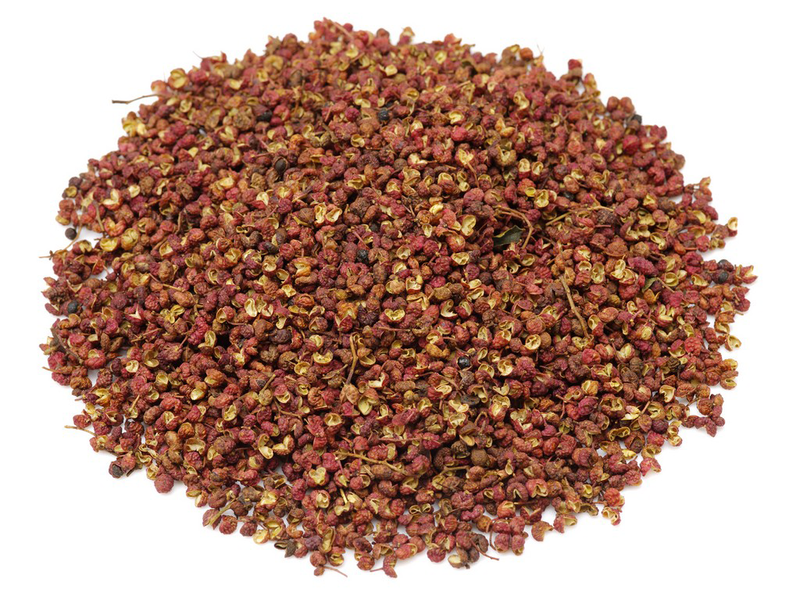 It is used in the treatment of arthritic and rheumatic conditions, digestive problems and leg ulcers. Bark and roots are irritant, odontalgic and antirheumatic. They are used in the treatment of fevers, ague, poor circulation etc. Fruits are considered more active than the bark; they are also antispasmodic, carminative, diuretic and antirheumatic. Pulverized root and bark are used to ease the pain of toothache. Rubbing the fruit against the skin, especially on the lips or in the mouth, produces a numbing effect. Tea or tincture of the bark has been used in the treatment of rheumatism, dyspepsia, dysentery, heart and kidney troubles etc. Tea made from the inner bark has been used to treat itchy skin. Night cramps in the legs have been successfully helped with Prickly Ash in traditional herbal medicine. Prickly Ash tincture is being used by physicians in the 19th century for patients suffering from peritonitis, distension of the bowels, severe abdominal inflammation and swelling, intense fevers like cholera, typhus and typhoid, and pneumonia. Lotion can be made from a decoction and rubbed on the legs or hands to improve circulation. Liquid or infusion obtained by boiling the bark in water was used to treat a wide range of ailments including gonorrhea as well as rheumatism or stiffness in joints and muscles. It was found to be helpful in treating arthritis and used it widely to cure the disorder. 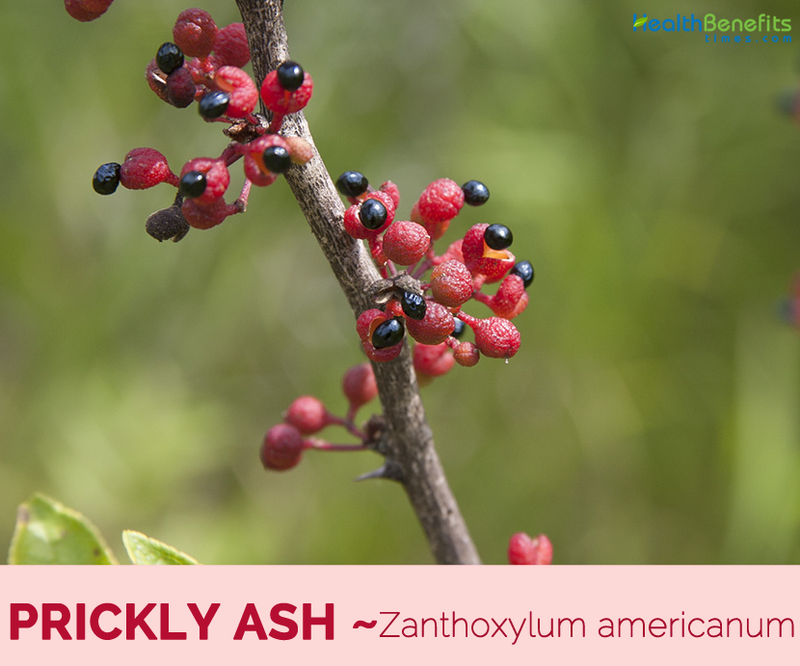 Prickly Ash is used to expel worms and treat candida, as well as relieving cramps, colic, and abdominal pain. 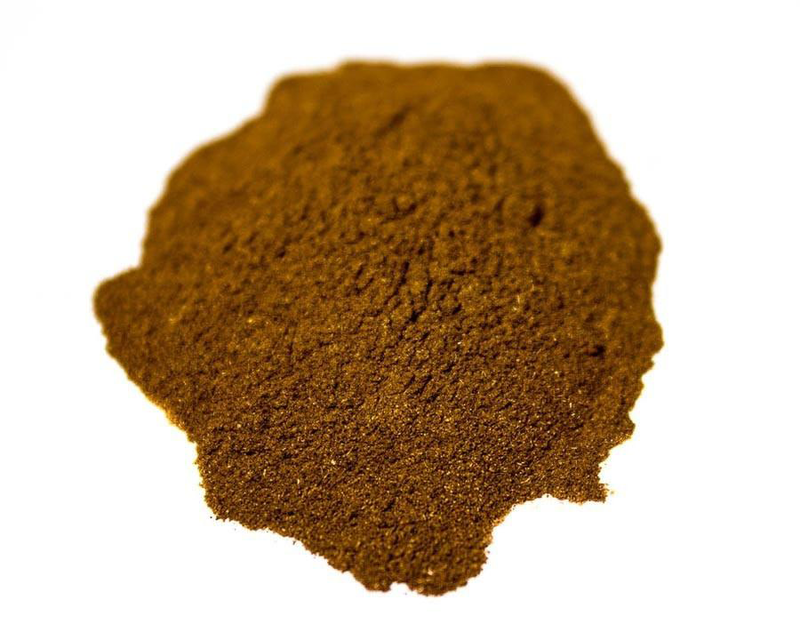 For yeast infections, it combines well with goldenseal. It is used for massage oil to sooth arthritic joints, infused Prickly Ash into sesame oil, either by itself or combined with eucalyptus or juniper berries. Oil extracts from the bark have been used in traditional and alternative medicine, and have been studied for antifungal and cytotoxic properties. 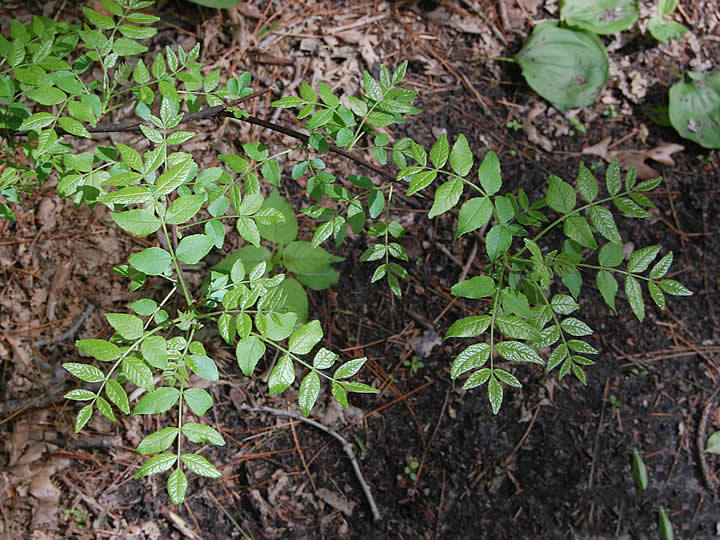 Itching: Boil the inner bark of Prickly Ash and make a wash for itching skin. Toothache: Chew the bark to get relief from toothache. Flatulence: Put one tbsp of dried bark or Prickly Ash berries in one cup boiling water. Do not boil again. Let it cool and take one cup a day. Only one swallows at a time. Wounds: Prepare an infusion of one tbsp powdered berries with one cup of boiling water. Use as a wash for ulcers and wounds. Chillblain: Take Hawthorn, prickly Ash in equal quality. Add one part of ginger to it. Prepare a decoction. Strain. Have one cup two times a day. An infusion of the bark was, at least once, placed on a dog’s nose to improve its scenting capabilities during hunting. Fruits were administered as diuretics to horses. Young men of the Omaha tribe used a perfume made from the fruits. Growing Climate Plant occurs along upland woodlands, bottomland woodlands, savannas, wooded ravines, thinly wooded bluffs, edges of shady seeps, stream banks in wooded areas, thickets, pastures, and fence rows. Soil Different types of soil are tolerated, including those that contain loam, clay-loam, and rocky material. Plant Size 10 meters (33 ft ) tall with a diameter of 15 cm (6 in). Pickles 8 to 13 mm-long prickles are scattered along the branches, twigs and shoots; these spines are somewhat flattened and curved. Leaf Alternate compound leaves about 1 to 30 cm long develop along the twigs and young shoots; they are odd-pinnate with 5-11 leaflets. Individual leaflets are 1½-3¼ inch long and ½-1½ inch across; they are lanceolate-oblong to ovate-oblong with margins that are smooth to crenulate (fine rounded teeth). The upper surface of mature leaflets is medium green, minutely glandular, and glabrous, while the lower surface is pale green and short-pubescent to nearly glabrous; in the latter case, fine hairs are restricted to the major veins. Newly emerged leaflets are more hairy than mature leaflets. The lateral leaflets are sessile or nearly so, while the terminal leaflets have slender petiolules (basal stalklets) that are less than ½” long. The light green petioles (basal stalks) and rachises of the compound leaves are hairy while young, but become more glabrous with age; they have scattered small prickles along their undersides. The dark green and lustrous leaves are dotted with translucent glands. Flower Flowers are arranged in small axillary clusters (cymes) along the branches of the preceding year. Individual male flowers are a little less than ¼ inch across, consisting of 4-5 erect petals and 4-5 stamens; there is no calyx. The petals of male flowers are yellowish green to orange and oblong in shape. Individual female flowers are about ¼” across, consisting of 4-5 erect petals and 2-5 separate pistils; there is no calyx. The petals of female flowers are also yellowish green to orange and oblong in shape. The ovaries of the pistils are glossy green and ovoid in shape; their elongated styles tend to converge at their tips. Seeds are cooked and are used as a condiment. Fresh leaves can be eaten in salads. Tannins may reduce gut iron absorption. Excessive ingestion may interfere with anticoagulant therapy. 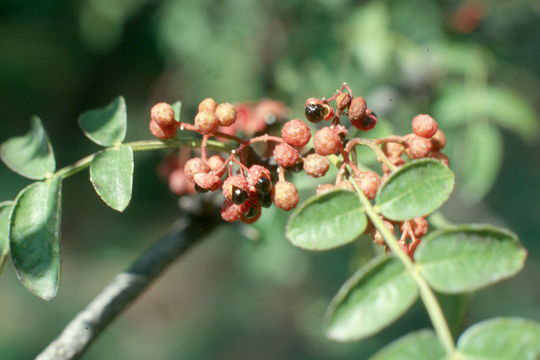 Traditional Chinese Medicine teaches that prickly ash should be avoided when there is fever with profuse sweating. 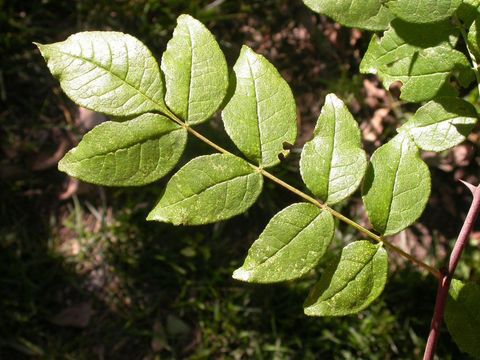 Prickly ash can stop lactation, and should be avoided by mothers wishing to continue nursing. People with a sensitive stomach should also refrain from using this herb because of its effect on circulation. Should be avoided by those with inflamed intestinal tracts.